In TSAS seniors, our mature builders can home in on tiny details and explore complex projects. Last week we challenged our builders to make working stilts. Each team went through several iterations, and refused to stop at "good-enough". They truly tinkered, finding novel solutions to traction problems (yoga mats + roofing nails), grip issues, and the dreaded getting-bonked-in-the-head-by-your-own-stilt. With stilts completed, we started in on the challenge that will occupy our next few weeks: the construction of the Tinkering School Library. We sat with paper, pencil and rulers to generate ideas for storing, organizing and displaying our burgeoning book collection. 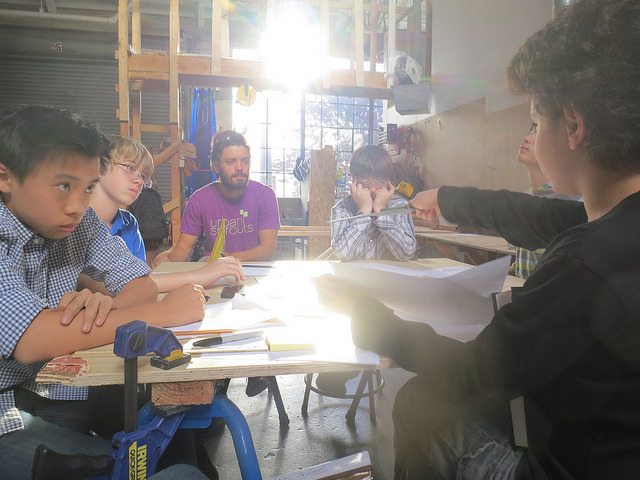 Inventive proposals were flying--invisible bookshelves, shelves made from slabs of redwood, and even a cart. Stay tuned to see what comes out of the workshop.